Meet Nell, the beautiful smiling lurcher. When Nell first arrived at DAWG, we noticed she had a lot of scarring across her face and body and an unusual gait when walking. On further investigation it was discovered that Nell had several serious old injuries resulting in extremely painful joints and muscles. 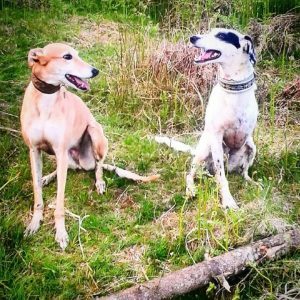 Despite all her aches and pains Nell is a very happy dog and lives peacefully in foster with several other dogs of various breeds and backgrounds, including Bijoux who is also in the Sponsor programme. While Nell was in a lot of pain, this is now under control using a combination of pain management drugs, acupuncture at Sunbeam Veterinary Hospital, food supplements and massage. Nell’s deep, dark, glistening eyes would melt even the coldest of hearts and she has a signature “smile” that make every single human smile back at her. 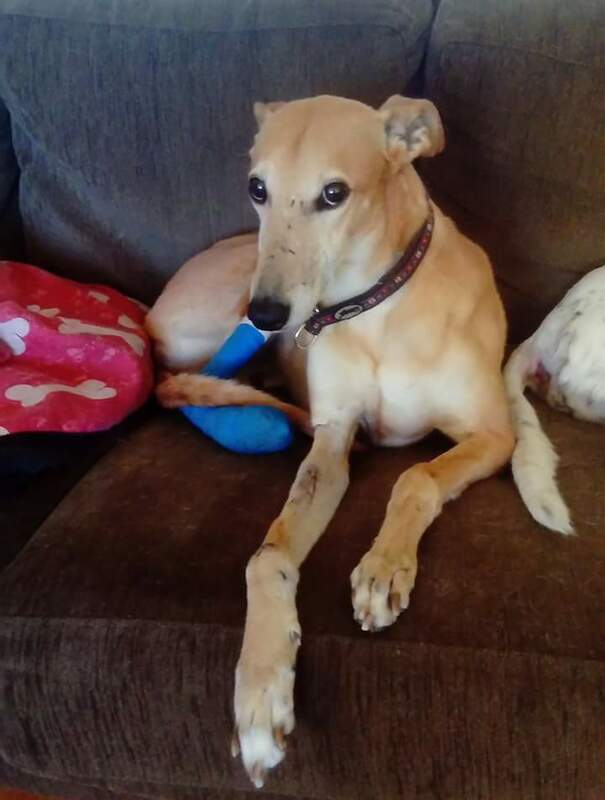 A typical Lurcher, she lays on the sofa for most of the day with her foster brothers and sisters, but since she began acupuncture, she bounces around when she knows she is going for a walk. While she is unable to keep up with her Lurcher foster sister Faye, she rambles along with her pack of oldies and smallies enjoying a sniff, and every few days has a 60 second sprint which is enough for her. All my dogs are very special but there is something about Nell that even strangers notice; everyone comes and comment on how lovely she is. Thank you so much for sponsoring Nell and giving her the quality of life she deserves.